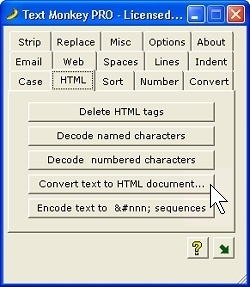 Boxer Text Editor • Text Monkey The Permutator F.A.S.T. 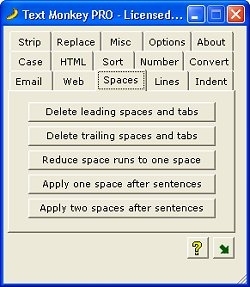 Text Monkey PRO is a fast, versatile utility that extends every Windows program you use. Text Monkey has dozens of useful text processing functions that were designed to save you time and effort on all types of editing tasks. 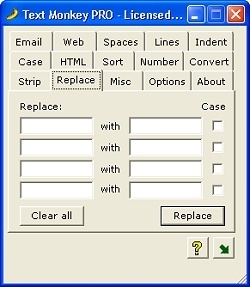 Because Text Monkey operates on text while it resides on the Windows clipboard, it extends the functionality of every program you use. Example - Cleanup Overquoted Emails: You've just received an important email, but it's been forwarded and quoted so many times it's almost impossible to read. 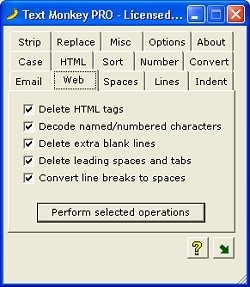 With Text Monkey, cleanup is a snap: just copy the message to the clipboard and paste back the cleaned text. How could it be so simple? 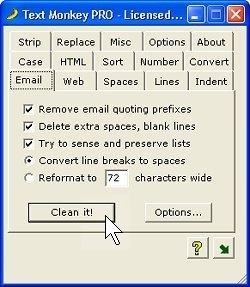 Text Monkey senses when messy, overquoted email text has been copied to the clipboard and cleans the text automatically, or upon your confirmation. Example - Extend Your Existing Programs: You're editing a list of items in the memo field of a large application. You realize that you'd like to number the list (or sort it, or delete duplicates, or indent it, or convert its character case, or …). Just copy the text to clipboard, click a button in Text Monkey, and paste back the result. Those are just three examples of how Text Monkey might help speed your work. With more than 40 other handy conversions, there are sure to be other ways Text Monkey will reduce the time you spend on various projects. Paul Myers reports that Text Monkey saved him hundreds of hours of work! As the old saying goes, “all work and no play makes Jack a dull monkey.” So just for fun, Text Monkey can convert ordinary text to “Teen Text”. youll b able 2 chat w/ your kidz. áNÐ ÐÓn'T éVËn gè† me $tÁrTÉd aþoÜt THe "CrAzY TeXt" fÈÁ†urÉ! 100% Customer Satisfaction Guarantee: We assure your satisfaction with a 30-Day Money-Back Guarantee. You must be satisfied or we'll refund your purchase price in full. Multi-User licenses are also available. Click here for full information. Don't have a credit card? Prefer not to order over the Internet? There are many other ways to order, click here for more information.